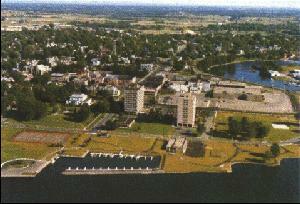 Ogdensburg, affectionately known throughout the region as “the Burg”, is located where the gentle Oswegatchie River flows into the majestic St. Lawrence River approximately midway along the St. Lawrence Seaway between the Canadian Cities of Kingston and Montreal, at the eastern end of the 1000 Islands Region. A rural city of approximately 13,000 residents, yet within a two hour drive of a population of over 15 million people, Ogdensburg combines a friendly small town atmosphere with the cultural and economic opportunities that abound in more urban settings. A Catholic Seminary College and a small two year college located in Ogdensburg, and within a 30 minute drive two state colleges and two private universities, Clarkson University and St. Lawrence University make St. Lawrence County the education mecca of the New York State. Ogdensburg residents and visitors enjoy breathtaking scenery and natural beauty, a rich cultural history, and abundant recreational opportunities throughout the year. Resort community excitement is just 30 minutes west at Alexandria Bay, while international metropolitan culture can be found in Canada’s capital city of Ottawa one hour to the north. In summer, the St. Lawrence River offers almost everything a boater, fisherman, or water sports lover could possibly pray for. The spectacular sunsets across the river are so commonplace that local residents hardly notice – but visitors are astounded by the vibrant colors that splash across our evening skies. The summer resort communities of the Thousand Islands, just west of Ogdensburg, have been the destination of choice for those in the know for over a hundred years. Winter sports enthusiasts should note that Ogdensburg is only two hours away from Lake Placid, twice the host of the Winter Olympics. White Face Mountain features one of the world’s most popular and challenging alpine skiing resorts, and the Adirondack Mountains south of Ogdensburg provide some of the most spectacular scenery on the planet in all seasons. So whether you are looking for a place for your next vacation, or if you are looking for a new place to call home, Ogdensburg has all you could possibly want.